The Blend Inn kohteessa Osaka, Japani: Varaa nyt! 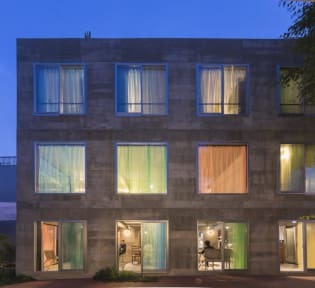 The Blend Inn is a small boutique hotel (hostel) with colorful curtains and eclectic furnishings located in a quiet area just outside the city center. 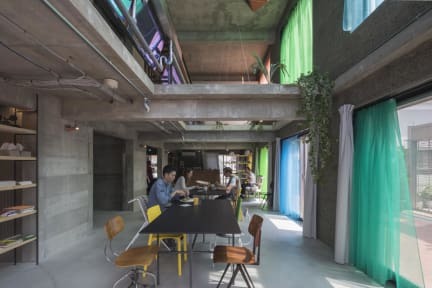 The building consists of a concrete shell that can easily adapt to house a variety of different functions and create an overall diverse and pleasant atmosphere. The interior furnishings are a mix and match of available items that create a fun and eclectic style throughout. The interior remains open with easy circulation between the public areas, which include foyers, eating and meeting space, and a shared kitchen. We are very close to USJ (Universal Studios Japan) . Our closest station is JR Nishikujo station on the Osaka Loop Line, only 7 minutes walk. To the city central, it's only 5 minutes to Osaka Umeda area, also 10 minutes to Namba, Minami area by the train. We can store your luggage between 7:30am and 10pm. You can use a credit card for payment on your arrival. We absolutely loved The Blend Inn! Beautiful space with a contemporary Japanese twist. Lovely personnel, delightful breakfasts for order and well functioning rooma and bathing facilities. Every detail has been thought of. Two train stations right next to it, safe and quiet neighbourhood. This was our first time in a hostel and in Japan ever and we were totally wowed by this place.